When major medical centers, small hospitals, or other labs need to separate tiny molecules via electrophoresis analysis, they turn to Helena Laboratories for their equipment. 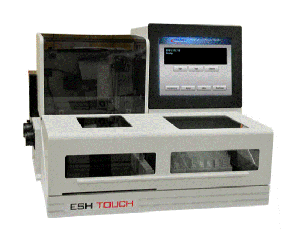 Recently introduced to the marketplace, Helena's ESH Touch Sampler Handler provides automated processing for high volume electrophoresis workloads. 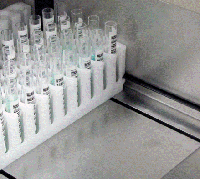 This device places samples of serum into trays to be further processed during an electrophoresis analysis. 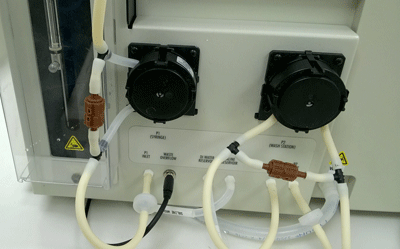 Small peristaltic pumps are used to move DI water and saline for washing the system's pipettes. To ensure fluids move smoothly through the application, our own Model #502/502 check valves (pictured in brown polypropylene) are used with these pumps. In case of a high pressure condition and to comply with CE certification standards, inventors at Helena placed the check valves in a circulation loop around the pump head. The pumps can create ≥ 30 PSI pressure, and the Smart Products check valves, customized at 16 PSI, act as a safety mechanism to ensure pressure doesn't continue to build up within the system in the event of a blockage. Maintaining flow-control at a certain PSI allowed Helena Laboratories to 1) meet certification requirements and 2) avoid additional costs of having to enhance hoses, fittings, etc. within this device. To learn more about Helena Laboratories and the ESH Touch, visit helena.com/Eshtouch.html. Easily mounted in-line for liquid or air applications, our Series 500 Miniature Check Valves eliminate the leak prone adapter seen in other valves by combining the fitting and check valve in one piece. This series allows you to combine any two end fittings or use the same configuration on both ends. The Model #502/502 is a 1/8" barbed check valve and like all of our products, it is fully customizable by plastic body, o-ring, and opening PSI.